Fully remodeled in winter of 2018. Read to make your vacation dreams reality? Our fully-protected harbor means calm waters and a more peaceful lake setting. Watch the kids play on the 100’ beach, 40’ Waterslide and Water Bongo all day, then get ready for a Bonfire at dusk (weather permitting). Please bring your own beach towels. Northern Lights Lodge offers guests a lake view with private dock and bonfire pit. Kitchen is completely equipped and full of stainless steel! We thought of all the necessary kitchen utensils & gadgets plus microwave, coffee maker, toaster and much more. Sleeping arrangement: king master suite and whirlpool tub for 2! 3 Queen Beds and 5 Twin Beds. This was the original owners home so you know it’s clean, comfortable and luxurious. Since this large capacity Leech Lake lodge is part of the resort, you have access to all the resort amenities too! This is 5 bedrooms/3 baths with central heat/air, washer/dryer, sleeps up to 14 with 1 king, 3 queens and 5 twins. 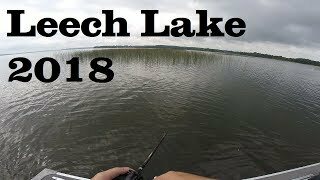 Less than 75' from the lake! come enjoy the Game room (pool table and arcades) fitness center, laundry facility, tennis/volleyball/basketball court, shuffleboard, horseshoes, children’s playground, water slide, boats, canoes, bait shop with fishing cleaning/freezing service. We have Turtle Races and fun Scavenger Hunts. Our Leech Lake Resort is blessed to be on the third largest lake in Minnesota! It’s going to take some time to explore the over 600 miles of shoreline. Swim in clear water, or catch dinner; Walleye, Large-mouth Bass, Northern Pike, Perch, Pan fish and famous Eel-pout. The Musky fishing is hard to beat! You don’t have to venture to far from the resort to find some of the area’s best hiking & biking trails, golf, riding stables, museums, shopping, antique shopping, fine dining, and casinos. If you’re up for a longer day trip, the Headwaters of the Mississippi at Itasca State Park is 50 miles away. 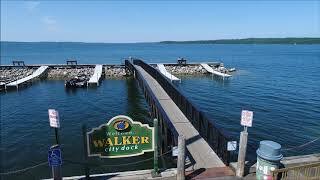 Since you book directly with our family at Anderson’s Grand Vu Resort, ask us about the Leech Lake area. Our knowledge of the Walker will come in handy. Like Live Branson-type fun? The Woodtick Musical Theatre is only 25 miles from Walker. CHECK-IN after 4 pm - CHECK-OUT by 9 am. This is flexible if you bought fishing packages. Spring or fall shorter stays are flexible too. 100% of the deposit is REQUIRED. Fishing packages require ½ down. 10.5% taxes, fees, license, gas & tackle are not included. My name is Jeff Anderson. My sons Quinn, age 17, and Harper, age 5, love sharing the best Leech Lake has to offer with their guests. We know how important great cabin time memories are to your family time. My family has several Walker, MN resorts - Grand Vu was the third resort acquired. I retired from the Minnesota Army National Guard in 2014 after 21 years of service. We hope you’ll come and see for yourself why guests find it hard to leave our Anderson’s Grand Vu Resort no matter what season you visit.